The Fort McMurray fire, which broke out May 2nd during an unprecedented spring heat wave in northern Alberta, now covers 423,000 hectares of boreal forest as of May 18th. The plight of more than 80,000 Fort McMurray residents, frantically trying to evacuate amidst fire and smoke, knowing they might not have homes to return to, has touched the hearts of Canadians. Most are still unable to return to their homes, and the fire has also had a devastating impact on First Nations and other communities in the area. The delegates at the 38th Central Convention of the Communist Party send our solidarity to all those who are victims of this terrible disaster. But Fort McMurray is not the only wildfire in western Canada this spring. 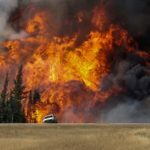 In Alberta there are currently 17 wildfires with two out of control. In BC there are five wildfires of note. In Saskatchewan there are nine active fires, with three not contained, and in Manitoba four active fires. Many of these lesser known fires affect First Nations communities; an out of control fire near the Doig River First Nation in BC is over 75,400 hectares. Such tragedies raise serious questions about the impact of human economic activity on the environment. NASA recognized in 2010 that wildfires in northern latitudes are a symptom of the Earth’s warming and climate change. These fires are accelerated by the rising emissions of hydrocarbons on a world-wide scale. Scientists state that every year the length and severity of the fire season worsens. Our earth is burning. While the Alberta tar sands projects themselves did not directly cause the heat wave, this industry is one of the most significant contributors to carbon emissions in Canada. In this sense, the TNCs involved in the tar sands and the international oil and gas industry, including ExxonMobil, BP, Shell, Total, CNRL and Chevron, can be considered the arsonists who caused the Fort McMurray fire, and they will cause more fires if they are not stopped,and if carbon emissions are not dramatically scaled back. Despite this, the energy monopolies and pro-corporate politicians argue that action to protect the environment will damage our economy. The Communist Party of Canada rejects the false “jobs versus the environment” dichotomy. The situation is critical, but scientists say it is not too late. Radical action must be taken to halt climate change. • Adopt emergency legislation to slash greenhouse gas emissions, and support reparations to countries and Indigenous peoples affected by capitalist-driven climate change. • Invest heavily to create jobs through renewable energy and conservation programs; phase out coal-fired plants and terminate reliance on nuclear energy. • Substantially expand urban mass transit, and eliminate bus and transit fares. • Legislate stringent vehicle emission controls. • Fund high-speed rail as a better alternative to highways and airlines. • Ban “biofuels” derived from feed grains. • Impose heavy fines and jail terms against polluters and destructive corporate practices, and ban industrial development in parks. • Adopt a People’s Energy Plan, including public ownership and democratic control of all energy and natural resource extraction, production and distribution. • Freeze and reduce energy exports. • Expand shared power flows among provinces through an East-West power and energy grid. • Block new development of the Alberta tar sands, and close these operations within five years, with jobs guaranteed for workers in more sustainable industries at equivalent wages. • Compensate the Aboriginal peoples and communities affected by the tar sands. • No to the Enbridge, Kinder Morgan, Keystone XL, Line 9 and Energy East pipelines, and to oil and gas exploration and shipping on the west coast. • Put a moratorium on the exploration and development of shale gas resources.